During the 2018 midterm election season, Hispanic registered voters show signs of being more engaged than in past midterms. According to the new survey, more Hispanic voters today say they have given “quite a lot” of thought to the coming election than they did in 2014 and 2010, and a majority of these voters say they are more enthusiastic about voting in this election than they typically are in midterm elections. 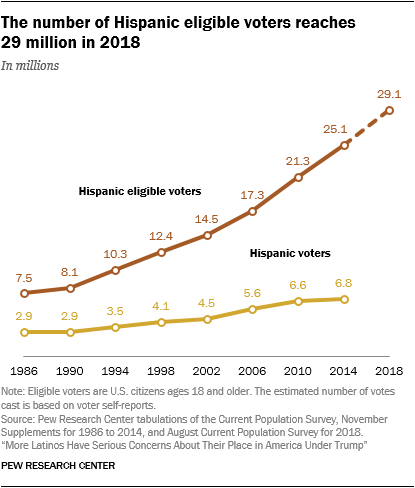 At the same time, the number of U.S. Hispanics eligible to vote (U.S. citizens ages 18 years and older) has reached a record 29.1 million, up by 4 million since 2014 alone. This enthusiasm stands in contrast to trends in Hispanic voting in recent midterms. In 2014, Hispanics cast a record 6.8 million ballots out of 25 million eligible voters, for a voter turnout rate of 27%. But that was far below the turnout rate among blacks (41%) and whites (46%) that year. It was also down from 2010, when 31% of Hispanic eligible voters turned out to vote. Overall, 52% of Latino registered voters say they have given the coming November midterm elections “quite a lot” of thought, a 16 percentage point increase from what they said about the last midterms in 2014. Even so, Hispanic registered voters’ interest in the midterm elections lags behind their level of interest in past presidential elections (as it does for all voters). In 2016, 67% of Latino registered voters said they had thought “quite a lot” about that year’s election, while in 2012 61% said the same. Interest in the midterms varies greatly among subgroups of Hispanic registered voters. About six-in-ten (63%) Hispanic voters with some college education or more have given a lot of thought to the coming midterm elections, compared with 39% of those with a high school diploma and 37% of those with less than a high school education. In addition, Hispanics ages 30 and older are more engaged than their younger peers, as 56% have given the elections a lot of thought, compared with 40% of those 29 or younger. Another result from the survey – responses to a question about enthusiasm – shows the increased engagement of the Latino electorate this year compared with previous midterm elections. A majority (55%) of Latino registered voters say they are more enthusiastic about voting this year than in previous congressional elections, while 32% say they are less enthusiastic and 11% volunteer that they are as enthusiastic as usual. Among Latino registered voters, those with at least some college education are more enthusiastic about voting this year than those with a high school education or less . Also, Latinos born in the U.S. are more likely than naturalized immigrants to say they are more enthusiastic this time around (58% vs. 47%). The Democratic Party has lost ground since 2016 among Latino registered voters. In 2018, about half (48%) of Latino registered voters say the Democratic Party has more concern for Latinos than the Republican Party. Meanwhile, about a third (32%) say there is no difference between the parties, and just 14% say the Republican Party has more concern. But the share of Hispanic registered voters who say the Democratic Party has more concern for Hispanics is down from a recent high in 2015, when 59% of Hispanic registered voters said the Democratic Party had more concern for Hispanics. Meanwhile, the share of Hispanic voters who see no difference between parties is up, from 22% in 2015 to 32% today. Views on the concern parties have for Latinos vary by party affiliation. Among Latino registered voters, 72% of those who identify with or lean toward the Democratic Party say their own party has more concern for Latinos, and 24% say there is no difference. 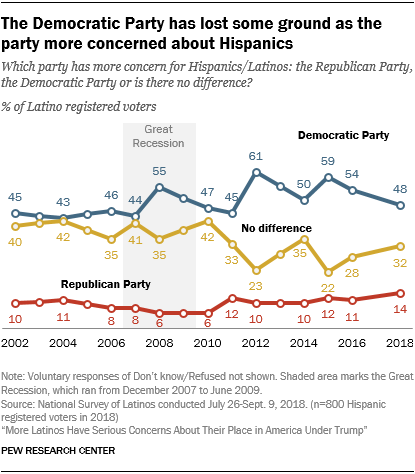 Meanwhile, 45% of Latino voters who identify with or lean toward the Republican Party say the Republican Party has more concern for Latinos, and 40% say there is no difference between the parties. Party affiliation among Latino registered voters has changed since 2012, when there was a spike for Democrats. In 2018, 62% of Latino voters identify with or lean toward the Democratic Party. 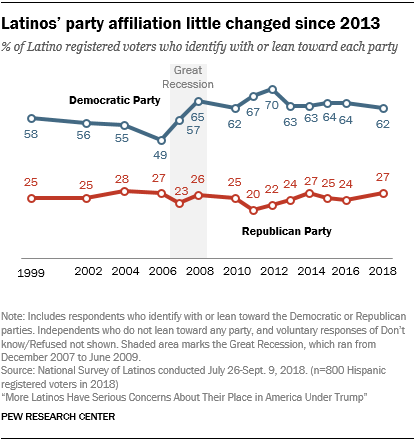 Meanwhile, the share of Latino registered voters who identify with or lean toward the Republican Party has rebounded from a low of 20% in 2011 to 27% today. Among Latino registered voters, those who primarily speak English are more likely to align themselves with the Republican Party (33%) than those who are Spanish dominant (15%). 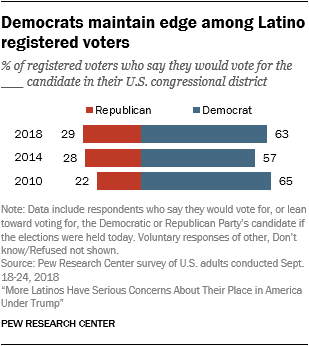 According to a survey of U.S. adults conducted in September 2018 by Pew Research Center, if the election for Congress were held today, 63% of Latino registered voters say they would support the Democratic congressional candidate in their district, while 29% say they would support the Republican candidate. Among all Latino registered voters, Democrats hold a two-to-one margin over Republicans this year. The share of Latino registered voters who say they would vote for the Democratic candidate is up from 2014; support for the Republican candidate remains unchanged.